This entry was posted in AAW, Anti-Submarine Warfare, ASuW, ESSM, EW, FFG(X), firecontrol, Laser, Shipbuilding by Chuck Hill. Bookmark the permalink. IIRC 57 mm was considered overmodeled (not keeping its promises)? 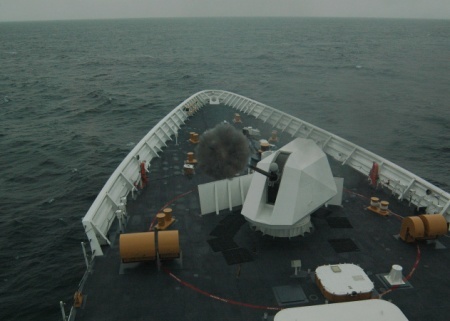 The reason given for the decision to replace the 57mm with the 30mm in the Mk46 mount on the DDG1000s was that the 57mm did not perform as well as expected or as well as the 30mm against swarming surface targets. I still think that was a mistake because the 57mm is more versatile than the 30mm and their calculations probably did not include the ALaMO round. It is usually easier and more useful to apply improvements to larger projectiles than to smaller ones, so the larger projectiles usually get improvements first and smaller ones may never get them. I am not particularly a fan of the 57mm. I would rather we had armed our cutters with 5″ or even the 76mm rapid fire, but it is what we have, and the new round is good news. Agreed, the newer 76mm would probably be an improvement over the 57mm, but I think that is primarily due to the wider variety of ammunition available. They are about the same range. The 76mm round weighs about twice as much but the 57mm’s rate of fire is about twice that of the 76mm, so the weight of projectiles hitting the .target is similar. The 76mm can maintain maximum rate of fire for about a minute while on the 57mm it is only about 30 seconds, but neither of them is a match for the range of a 5″ and it penetrating power, and its ability to maintain rate of fire until ammunition is exhausted. I also suspect the total cost of a magazine full of 5″ is less than a magazine full of 76mm or 57mm assuming a similar total projectile weight.